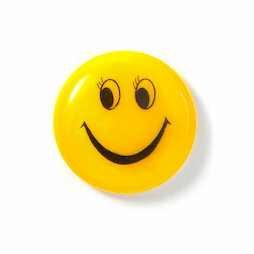 A female smiley magnets with long eyelashes that brings a smile to every face. Whether in the office, living room, kitchen, hallway or conference room - this fridge magnet spreads good mood in every room. The ferrite magnet is significantly weaker than a neodymium magnet but it's enough to hold up 2-3 sheets of A4 paper.